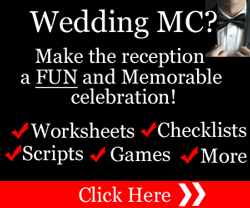 It’s no secret that being asked to be the Wedding MC is a huge responsibility which is why most Wedding MC’s want to know how to MC a wedding reception. 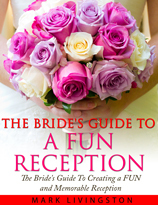 After all, the success of the reception depends primarily on you and how well you plan beforehand. And most wedding receptions take a huge amount of preparation not only be an effective Wedding MC but also to make the reception a success. You might not realize it, but if you’re the Wedding MC, you’re coming in at the final stages of the wedding planning. 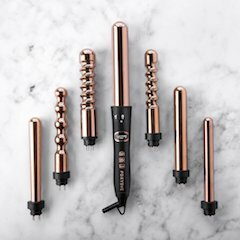 And in many cases, you won’t know who the members of the wedding party are, who the key vendors are, and you might not even know the bride or groom very well – depending on your relationship with them. So you have to get “up to speed” fast in order to make the reception a success. The wedding planners will usually be the bride-to-be and mother of the groom. They might also include professional wedding planners. You have to know what the bride and groom expect from you as Wedding MC. You have to know the right questions to ask. You have to know why you’re asking the questions and how to use them at the reception. You will prepare the wedding agenda or run sheet as you talk to bride and groom. You want to know what the bride and groom want at their reception. Remember, this is a celebration of their marriage with people who are closest to them. …with laughter and good times. In fact, make it something that will be remembered. Of all the things that happen on the wedding day, the wedding reception will be remembered more than the wedding reception by most of the wedding guests. Fun and laughter at the wedding reception starts with entertainment activities and wedding games. You don’t necessarily have to come up with extraordinary ideas to make it a memorable wedding reception. You just have to have ideas that will mean the most to the bride and groom on their special day. You want the newlyweds to remember this special time with moving and sentimental – even romantic – moments that are woven throughout the reception. Most of all, if you plan things correctly and follow your Wedding MC Duties you’ll make this a celebration that the bride and groom remember for years to come. If you’re like most novice Wedding MC’s you don’t know where to start in planning the wedding reception. Fortunately, you don’t have to suffer the humiliation or embarrassment of having to admit you know virtually nothing about planning a wedding reception! Instead, you can have How to Be A FUN Wedding MC by your side to guide you virtually every step of the way through the wedding reception planning and show you what to do and what to say. You’ll get comprehensive planning sheets, checklists, entertainment and wedding games ideas, scripts on what to say, how to introduce the bride and groom, the wedding party, and special speakers, and sample wedding agendas (run sheets) for short and long wedding receptions. How To Be A FUN Wedding MC takes the novice Wedding MC from start to finish through the wedding reception planning process and will boost your confidence when you’re standing in front of hundreds of wedding guests who are eager to have a fun time. 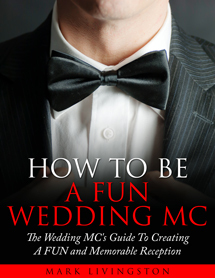 How To Be A FUN Wedding MC will save you many hours of time and reduce your stress as you discover the secrets of How To MC A Wedding.